With an exponential gain in value and thousands of businesses now accepting it as a form of payment, Bitcoin has quickly become one of the trending topics throughout the country. While there are various types of cryptocurrency out there, Bitcoin is currently the most popular form of digital currency (also known as virtual or cryptocurrency) throughout the world and is able to be exchanged for U.S dollars, Euros, and other real currency. In addition, Bitcoin can be traded for other virtual currencies, such as Ripple or Ethereum currency. Whether people use cryptocurrencies to pay for products and services or strictly for investment purposes, they may not be aware that they have a possible taxable impact. If you have not reported your cryptocurrency taxes this year, you are not alone. In this article, we are going to review cryptocurrency and taxes, as well as what to do it you still have not reported them. Before diving into the details of digital currency and taxes, we wanted to ensure our readers that while this article provides helpful and detailed information, it does not constitute professional financial counsel and should not be used as a replacement for tax advice from professional CPA firms. As such, we recommend reaching out to local CPA firms for individualized service that is tailored to your unique tax situation. Do You Have To Pay Cryptocurrency Taxes? In the past, many cryptocurrency investors pocketed profits and avoided taxation by selling virtual currency and putting the money made back into other digital tokens. This method, and loophole so to speak, is known as a like-kind exchange. However, with the value of cryptocurrency taking off this past year, along with the profits of investors, the IRS is holding it down come tax season. In addition to closing this loophole that many crypto holders used, the IRS has stated that cryptocurrency is considered property and that selling digital currency should be reported as a capital gain or loss. But what does this mean? Well, this means that selling certain virtual currencies in exchange for another virtual coin, or even using cryptocurrency to buy goods and services, is considered taxable and therefore should be reported come tax season. It is mandated by law that you pay taxes on those earnings. What Happens If You Do Not Report Cryptocurrency Capital Gains? Some cryptocurrency investors, despite the IRS’s warnings, still choose to hide their profits by not reporting their capital gains from virtual currencies. This is no surprise, especially after a past survey revealed that over 35 percent of cryptocurrency owners claimed they do not plan on reporting any gains or losses on their tax return. What many investors in this percentage may not be aware of is that not reporting their capital gains and losses is a form of blatant tax fraud. Purposefully hiding profits and failing to report capital gains can enable the IRS to enforce numerous penalties, such as criminal prosecution, which is generally used in more extreme cases that involve larger profits and capital gains. Those that commit this tax fraud can potentially face up to five years in prison. What’s more, there is generally a fine up to $250,000. Similarly, crypto investors that purposely file a false tax return to hide capital gains may have to pay a $250,000 fine, as well as face up to three years in prison. Of course, keeping track of all of the transactions made with virtual currency is not always easy. There are not any promises that distributed digital currency exchanges are going to send a Form 1099 that details your trades as well as your profits and losses. Not to mention, if virtual coins were used to pay for goods and services, that is a taxable transaction that you will have to handle entirely on your own. While crypto transactions can be complex, the IRS and government fully expect us to comply with the set tax guidelines for cryptocurrency. Failing to do so can lead to further complications and issues down the like. What If You Didn’t Report Capital Gains From Cryptocurrency? File a corrected Form 1099-MISC if you paid independent contractors with digital currency. File an FBAR, or a Report of Foreign Bank and Financial Accounts to disclose foreign digital currency wallets. Enroll in the Offshore Voluntary Disclosure Program to help reduce any potential fines and penalties and avoid jail time. Get help from a local tax consultant. 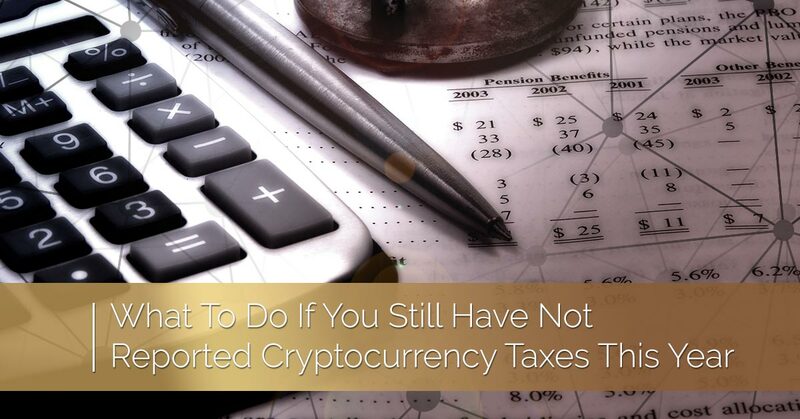 While taking these steps can potentially help reduce any fines and penalties, or even protect you from criminal prosecution, if you still have not reported your cryptocurrency income and capital gains, it is vital that you discuss your situation with an experienced tax CPA that specializes in Bitcoin and other digital currencies. If you have questions about reporting virtual currencies on your taxes, a certified CPA should be able to assist you. What Happens If You Owe and Do Not File or Pay Your Taxes? When your taxes are late or not paid, the IRS will assess a failure-to-pay penalty. This penalty goes into effect after the regular due date. Typically these penalties are a certain interest charge of the balance due for each month or part of a month you are late. Once the IRS discovers that your taxes are late, they will begin to send you computer paragraph (CP) notices. These notices will show how much you owe and demand immediate payment. If no actions are taken, the notices will continue to pop up in your mailbox for two to six months. If you avoid the notices and still do not pay the owed taxes, the following can occur. When the IRS seizes your assets, it is known as a tax levy. A tax levy only happens when all forms of communication and arrangements are ignored. The final notice will be sent at least 30 days before further action is taken. A wage garnishment, also known as a wage levy, is when the IRS contacts your employment provider and demand a portion of your paycheck. This will occur during every pay period until the taxes are paid in full or a payment agreement with the IRS is reached. A bank levy is when the IRS contacts your bank. When this happens, your bank will instantly freeze your accounts so you are unable to take money out. If arrangements are not made, the bank will send money to the IRS about three weeks later. This of course is something that shouldn’t be taken lightly. The IRS has the ability to seize various assets like vehicles, houses, boats, and other assets if the owed taxes are not paid and an agreement has not been reached. This is something you will want to avoid, as getting seized property back can often be a long and difficult process. Many people don’t know this, but the IRS can revoke or suspend the passports of delinquent taxpayers who owe more than $50,000 in taxes (including interest and other non-payment penalties). Not to mention, the State Department will likely not issue or renew your passport if you owe more than 50K. Again, if you fail to pay your taxes, most of these penalties and negative consequences can be prevented by working with a tax professional or the IRS directly. If you searching for local CPA firms in Charlotte to assist you with reporting cryptocurrency income and capital gains, contact Camuso CPA. Whether you need tax preparation services, assistance with properly reporting gains and income from virtual currencies on your taxes, cryptocurrency portfolio analysis, or any other service provided by a certified accountant, Camuso CPA can help.